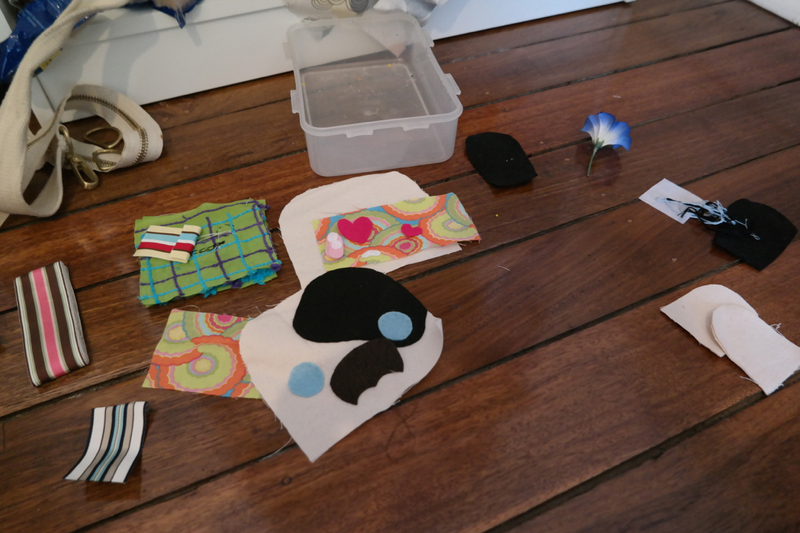 The past few months have been rather quiet, with regard to working on anything business or craft wise. I can’t really say the same for other aspects of my life! Work has been busy (which is good, considering the Newcastle economy is a bit crap), Pat is off to do his training until September-ish, and I’ve been staying away for work quite a bit. But anyways! Enough excuses. After a few weekends spent catching up on doing household tasks that I’ve been neglecting (say, a rotting pile of wood/banana leaves/weeds that have been piled onto the driveway for a few months and were starting to smell), I’ve gotten the proper mind-set to actually accomplish things. Little things, but things none the less. Sometimes we have to realise those little things add up and eventually snow ball into something great. I’m still at the stage of watching the snow accumulate on the ground (a rather slow and agonising process let me tell you), but I’ve managed to finish off two relatively small projects that I’ve managed to drag across the pond and in through many many house moves before actually spending the 30 minutes to finish them. 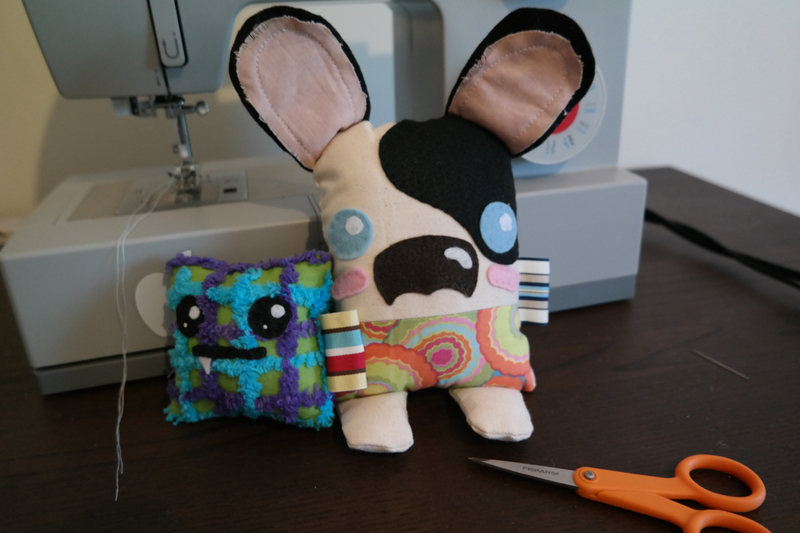 While organizing some bits and bobs from my stash I found a plastic baggie containing two half finished projects… a plush doggie and a wee square monster! No time like the future to finish them… Small accomplishments. Basically all I had to do for this guy was finish sewing on the eyes and sew him all up! Isn’t that fabric amazing? I bought it during the poor high school years. Yeah, most people were saving their part time job money to buy booze or food, and I was splurging on fabric. 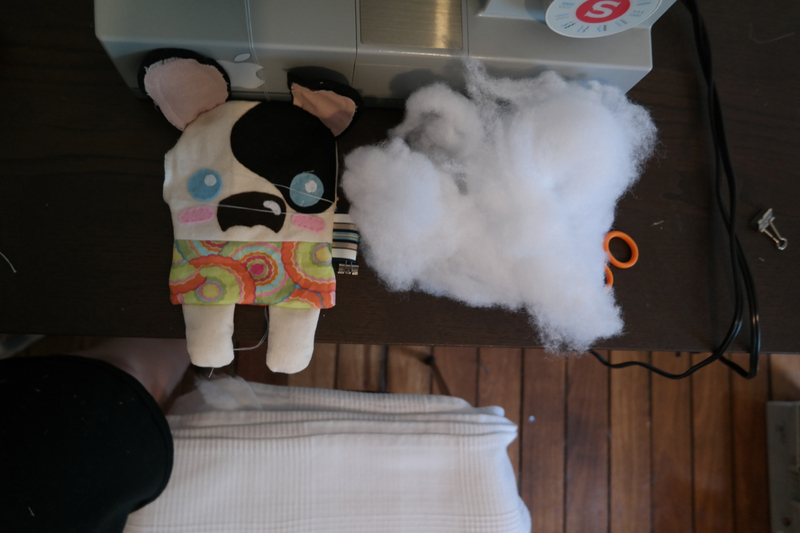 The dog took a bit more time, but really, after everything is planned and cut, it doesn’t take that much time to sew everything together. 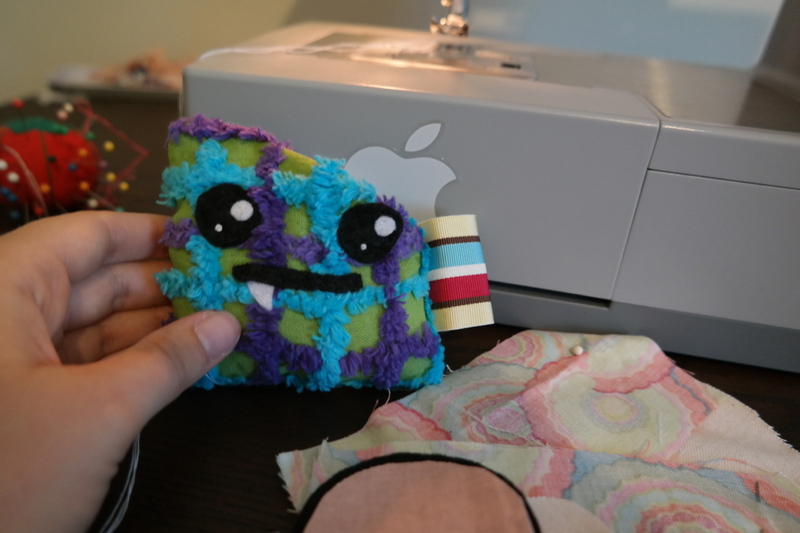 Here he is all stitched up, waiting to be stuffed like a family lined up a Ryans buffet. Well, here it is, a whole half an hour worth of work to finish some wee projects that I’ve been carting around for a few years now.